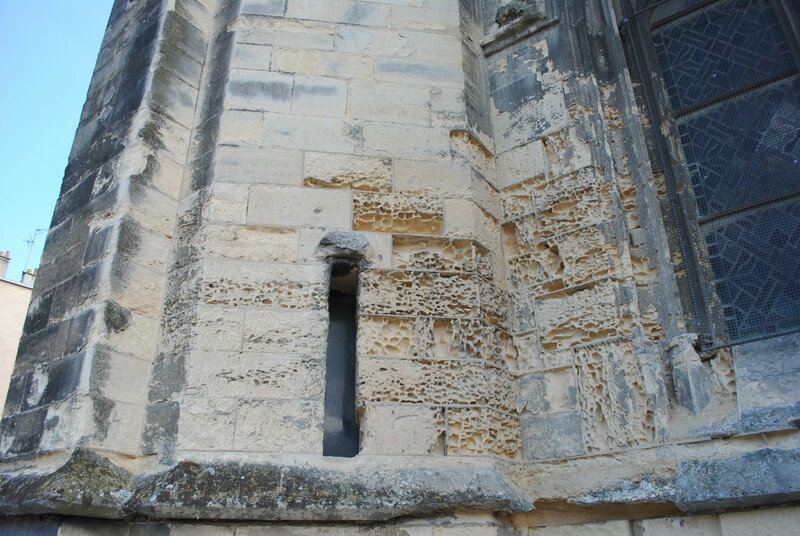 points to examples of honeycomb weathering on building stone. Soluble salts in alveoli have later been detected on many other outcrops in the world, and suggestions have been made that they advance the weathering process. For instance in coastal, but also in arid regions, chlorides often appear in such structures. Alongside, other influencing factors like the induration of the surface are still being discussed, e.g., due to local precipitation of reworked silicic acid on the surface of the rock. In nature such silica weathering processes on rock surfaces proceed very slowly and take a very long time to develop. In buildings or monuments, several types of stones are prone to alveolar weathering. Amongst these are particularly porous sedimentary rocks (such as sandstones, limestones and tuff). Often visible by the naked eye, the inhomogeneity in the fabric of natural stone effectively causes this weathering pattern. The structure of the sedimentary layers, foreign inclusions, bioturbations or other such disruptions, can cause during the weathering process the relief development at differing speeds. The structurally influencing factors relating to the specific stone, which are responsible for the formation of alveoli, are generally displayed in the developed weathering patterns. Causal differences in the micro-structure can be determined quantitatively, for example, in the contents of minerals with a low resistance to weathering or in the pore size distribution. These differences generate the preconditions for a relief to develop on a previously level surface. An essential role for the progress of weathering in nearly all investigated cases, is played by salts. Salts are usually introduced into the stone via a contaminated environment and by reactions with mortar. Author: Huinink, H. P.; Pel, L.; Kopinga, K.
The high concentration of salts in the depressions will crystallize upon further drying, and when rewetted it leads to the hydration of salts and to detachment of grains from the stone´s surface. This process enlarges the initially small depression. Often loose accumulations of detached stone grains and salts can be found inside the larger cavities. They repeatedly reappear after removal. Now the alveoli deepen and connect with neighboring cavities, because walls or ridges are eroded. The gypsum encrusted surface, meanwhile, remains stable due to a higher resistance to weathering. The decay pattern of advanced alveolization has been established through detailed investigations on facades. The findings are in accordance with the suggestions made by Beyer in 1911, based on his observations about the combined effect of readily and poorly soluble salts on natural outcrops. Further detailed investigations, considering other case studies are necessary in order to fully understand the dynamic of weathering and the influencing factors of alveoli formation on building stone.